Faster and EASIER than Detail Clay! The Hi Tech Magna Sponge is an innovative rubber polymer product that replaces clay bars and redefines how easy pre-wax cleaning can be. The Hi Tech Magna Sponge safely and easily removes overspray, tree sap, rail dust and other bonded surface contaminants from the surface of automotive paint, glass, moldings and plastic. 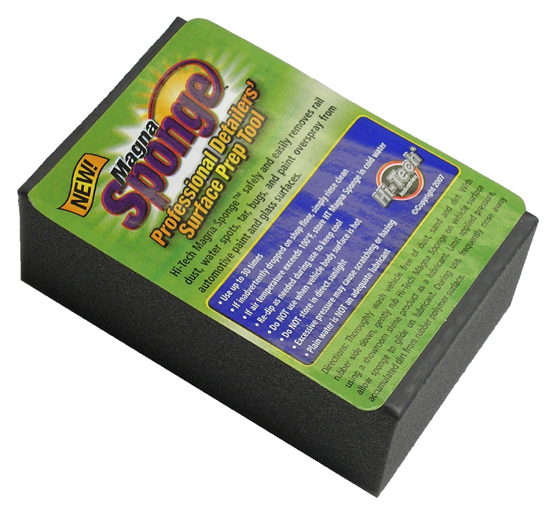 Use the Hi Tech Magna Sponge with your favorite spray detailing lubricant, it can also be used with soap and water.